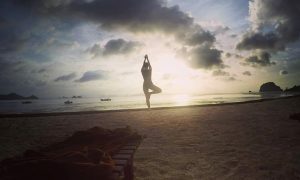 Kathy’s classmate relaxes while doing some yoga looking over Phang Nga Bay. 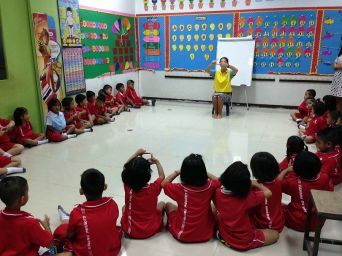 Kathy has just finished Week Three of her TEFL course in Phuket. 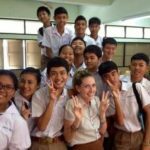 first-hand tips on how to get a great TEFL job. 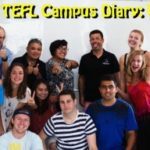 Kathy’s 3rd installment of her TEFL course diary (be sure to read her diary for the 1st and 2nd week) indicate that the initial nervousness that naturally comes with EFL teaching has subsided, while her confidence and teaching skills are on the rise. She’s more settled going into her last week but she’s also anxious about getting a job after the course. 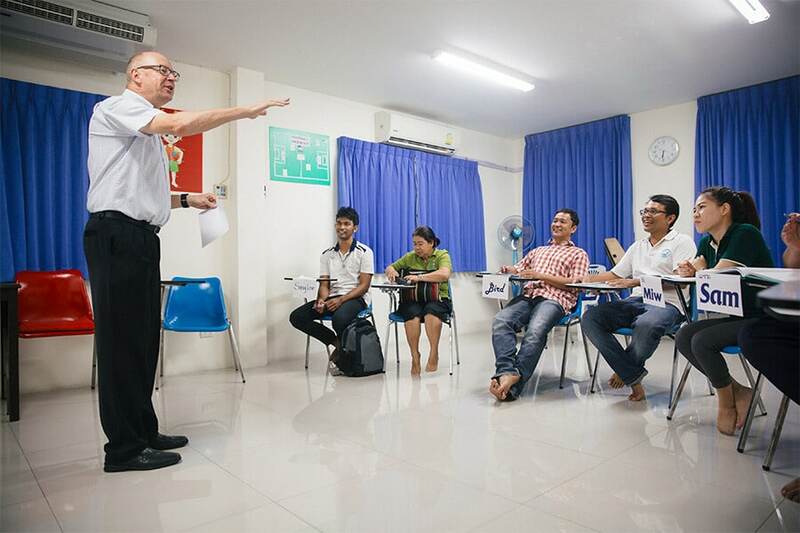 What did you get up to over your second weekend on the TEFL course? 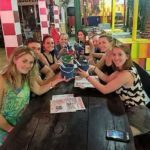 The second weekend I checked out the beautiful island of Koh Yao Yai with some of the other trainees. We got great little bungalows on the beach and spent the weekend relaxing in the sun. 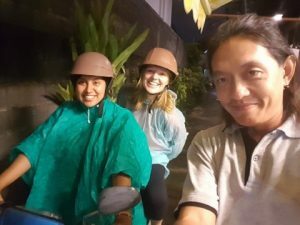 Sakul House owner (Nong) preps Kathy and Arlene for their first motorbike ride in the rain. You’ve been at your accommodation now for two weeks. Are you still happy with your choice to stay at Sakul House? Absolutely. I have already asked to stay another month. The environment is so welcoming and friendly that I’m just not ready to move out. Was the start of Week Three any easier than the start of Week Two? 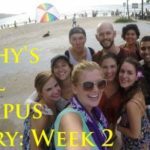 Week three was when it all got crazy! Projects, studying, teaching, so much to do, but budget your time and you’ll be alright. Is English grammar starting to make more sense now, or does learning it seem like a hoop you have to jump through to pass the TEFL course? It definitely makes more sense now. 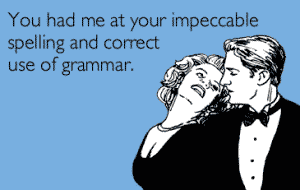 At the beginning of the course we did an overview of grammar which made it seem more overwhelming. Now we are diving deep into it, which makes it easier to understand. Also teaching a lesson on a specific grammar point makes you really understand it. 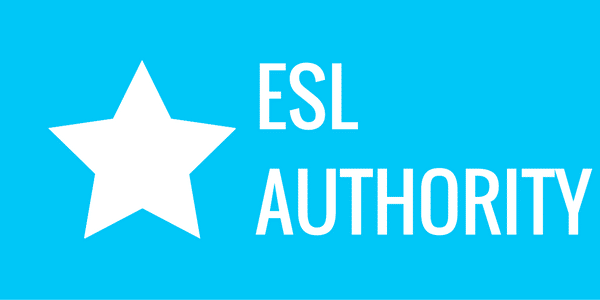 You might be a fluent speaker but can you identify an auxiliary verb, a gerund or the present perfect tense? 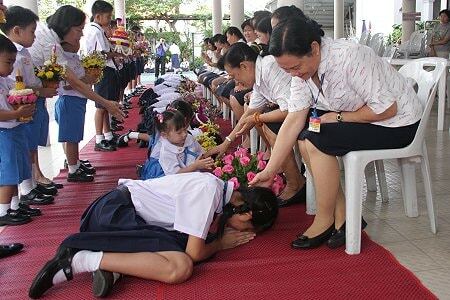 You’ll need to be able to do this and much more before you enter the TEFL profession. You’re meant to have become a bit more independent with lesson planning. Do you feel that is the case? Definitely. I’ve started to get my own routine down of how I like to plan out the lessons. You also get faster at planning which can be a good or bad thing. 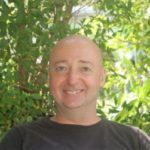 What have you found to be the most interesting part of lesson design? the proverbial deer in headlights. Are there any teaching skills you’ve found to be more challenging than others? If so, which skills? Sometimes I take the lesson planning too seriously and my lessons are well designed and effective but they could be way more fun. 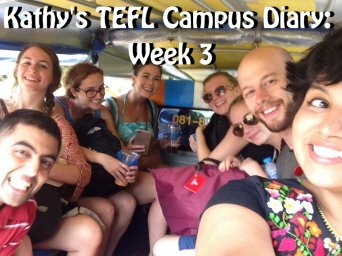 Sept ’15 TEFL Campus graduate (Zach) made a smooth transition from TEFL training to EFL teaching. 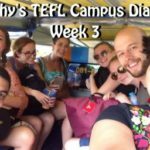 You had a lecture on TEFL jobs and job search strategies in Week Three. Do you feel more confident about your job prospects now? Yes, we were given a lot of advice on places to apply and where not to apply. Good working conditions and not so good, as well as advice on the interview process. 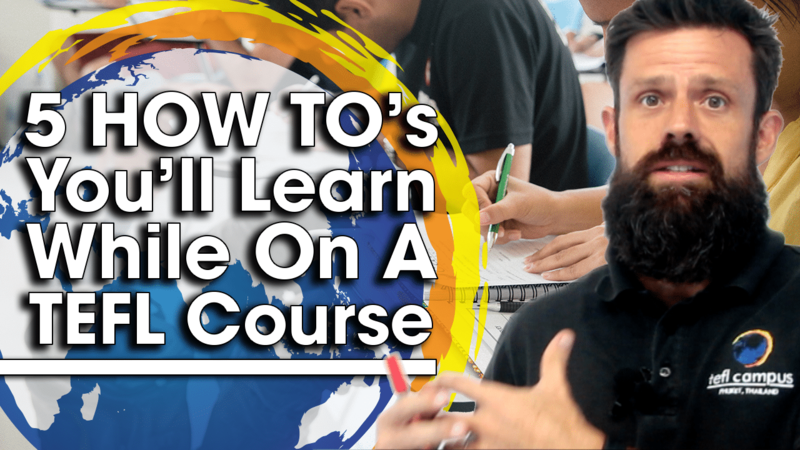 Where are you hoping to get a job after the course? Phuket Town, or Chiang Mai. 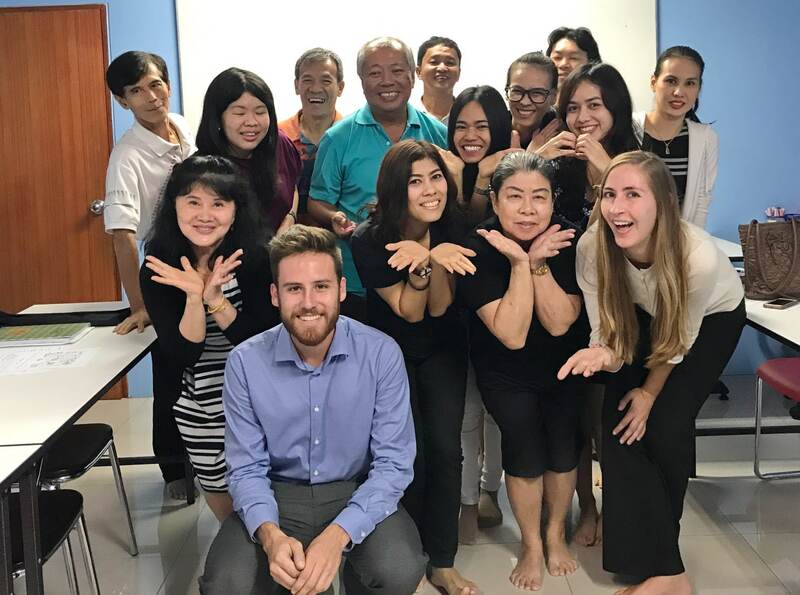 Did you find speaking with experienced TEFL teachers gave you insight into what it’ll be like to teach in a Thai classroom? I feel the only way to prepare for the classroom is to be in it. But it was helpful to hear what the experienced teachers had to say, especially about class sizes, that’s what I think my biggest hurdle will be. You’ve got an assignment coming up for Monday of Week Four and the final exam later next week. Any nerves with respect to finishing the course out? Prioritizing my time, getting everything done, and making sure I’m prepared for the exam is definitely making me nervous, but I know I’m so close to the finish line! Any plans for your last weekend of the course? Two words: study and sleep. 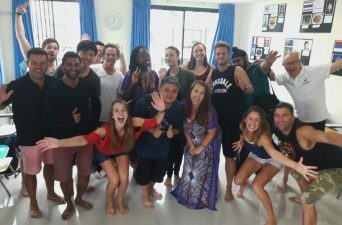 Be sure to read Kathy’s diary entry for the last week of her course. 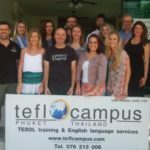 For more information on taking a TEFL course in Thailand, please contact TEFL Campus Phuket.